Looking for your Piece of Paradise? Look no further, this is it! 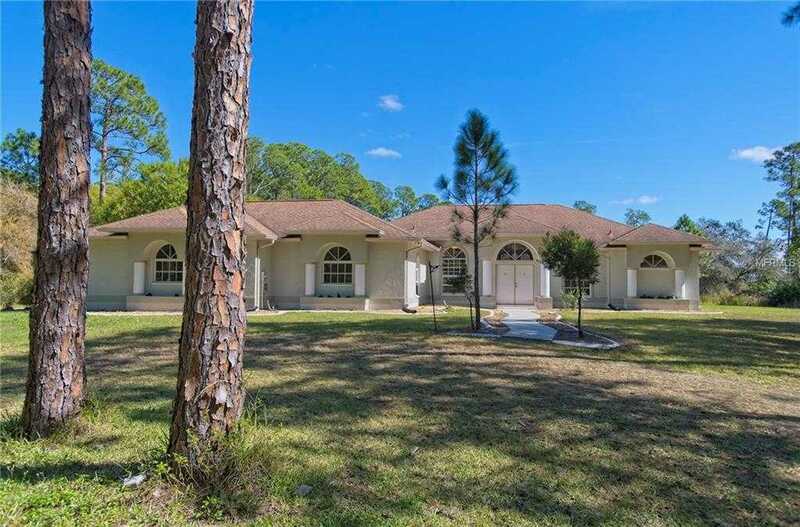 North Port Estates is horse country and this sprawling one story home is set on 3.2 acres (great privacy yet close to everything). Walk through the front entry into Bright open living space which looks out onto an over sized screened pool deck with an 18’x24′ gunite pool with fountain. Layout offers Formal Dining Room and Large Office, Private Master Suite with Large Bath and Double Walk-in Closets with Sliders to Lanai/Pool. Large Family Room located off Kitchen with Bath to service Pool Area, access to outdoor shower. This is a split layout that provides privacy to all. Side hallway to 2 Bedrooms and Bath. Laundry Area leads to HUGE Studio/Game Room/Exercise Room and 3 Car Garage. This home is an entertainers dream or a quiet retreat. Custom Details Galore. Property Zoned Agricultural so bring those horses, etc…. or just enjoy what nature provides! 13; Pasture has gone back to nature but if you want horses it can easily be groomed back to pasture – or just bring in some goats to do it for you…..This is a MUST SEE property!! Please, send me more information on this property: MLS# C7411542 – $529,000 – 6488 Ponce De Leon Blvd, North Port, FL 34291. I would like to schedule a private showing for this property: MLS# C7411542 – $529,000 – 6488 Ponce De Leon Blvd, North Port, FL 34291.